David Vs. Goliath II: Can Haye secure his famous legacy? This Saturday will finally see the end to one of boxing’s longest sagas. 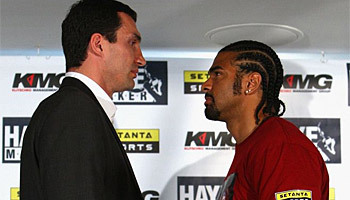 David Haye versus Wladmir Klitschko has been a long time in the making and both fighters will be eager to prove that it can be worth the wait. A wait which at times has been rather irksome. The pair of World Champions are both undoubtedly class acts in the ring but out of it they are different beasts. Haye is a cocky, smug, arrogant and above all a bit of a playground bully. Klitschko on the other hand is a smarmy teachers pet. Both have their magic moments with the media, but the anticipation surrounding this bout has allowed the two of them to become rather self-indulgent. Blissfully we will finally see the two of them in the same ring for the first time ever this weekend. The stage-show will reach it’s conclusion and the fight itself has the potential to be an absolute classic. Each fighter has sheer and utter self-belief in themselves. Such confidence is often just bravado, but in this case each of them have plenty of reason to believe that they are capable of a career defining victory. Since moving up to the Heavyweight division, Haye has been unstoppable. His first fight which won him his world title against Russia’s nature defying Nikolay Valuev was a demonstration of magnificent hit-and-run boxing. His defence was such that the then World Champion Valuev barely landed any of his earth-shattering punches. In the mean time Haye managed to sneak in with his impressive speed and land heavy blows of his own which rocked the giant. Since then however, Haye has fought two fading forces. One was the resilient John Ruiz, who Haye destroyed bit by bit, bone by bone. The other was Audley ‘A-Force’ Harrison, who again Haye tore to pieces. But in truth these two fights were foregone conclusions. Haye’s attributes were more than enough to dispose of them with little fuss, and this begs the question as to why Haye even decided to take on such fights. For a man seemingly so keen to fight as many high profile heavyweights before an early retirement later this year these fights seemed like odd selections. He has publicly demonstrated his desire to leave a legacy when he retires and such a feat will only be achieved by taking on the likes of Wladmir. We can see then why this fight is so crucial to Haye and his ambitions. On the face of it this fight appears to be there for the taking. Haye is supremely talented and has strength way beyond the usual limitations of people with his stature but is it enough to defeat a highly reputable World Champion like Klitschko? He has already beaten a Heavyweight World Champion in the form of Valuev but Klitschko is a huge step up. Not only is he a huge man with immense ring presence and strength, but he has good footwork and knows when to throw his punches. Haye’s defence and evasion were super slick against Valuev but it will have to improve two-fold again if he hopes to prevent Wladmir from landing. At Heavyweight level David Haye’s chin has not yet been put to the test and it seems unlikely that Klitschko will fail to land significant blows. Haye must be prepared to endure such moments of shock and trauma if he is to come out of the ring with three belt to his name on Saturday evening. Couple Klitschko’s far greater boxing talent and pedigree in comparison with Haye’s previous Heavyweight conquests, with the Partisan venue and it becomes hard to foresee a full-distance win for David. It seems that if he is to secure his greatest ever victory that it will take an aggressive approach and a win by way of knock-out. This is certainly not beyond the realms of possibility given that Klitschko has indeed been defeated in such a manner before, but it is certain that Haye will have to produce his very finest in order to chalk up another major scalp. The public perception of Andy Murray both on and off the court has always been a little strained. He has established an on court persona which has led many to believe he is just a spoilt kid with a lot of talent. This perception has always seemed immensely unfair to me given the circumstances existant within contemporary tennis. He is, as we are constantly reminded, still a young man. Not only this but he is a young man that is desperate to achieve highly in what is arguably the most competitive era that men’s tennis has ever seen. To outclass and outshine all comers and then fail to jump the final hurdle against the likes of Nadal, Federer and Djokovic must hurt him. As such it must be incredibly frustrating for a talented individual like Murray who arguably would have already won a handful of Grand Slam titles if he were competing in a slightly weaker era. Such frustration does tend to manifest itself in on-court agitation and tantrums, but this is true of legends such as John McEnroe also. Could it be that such strops became rather an endearing quality within McEnroe’s game? There was certainly a greater air of comedy about his personal outbursts and umpire conflicts than Murray’s expressions of his own low temper threshold. Is Murray really that much more negative though that he is deserving of the wave of stick that he tends to be subjected to? Perhaps not. 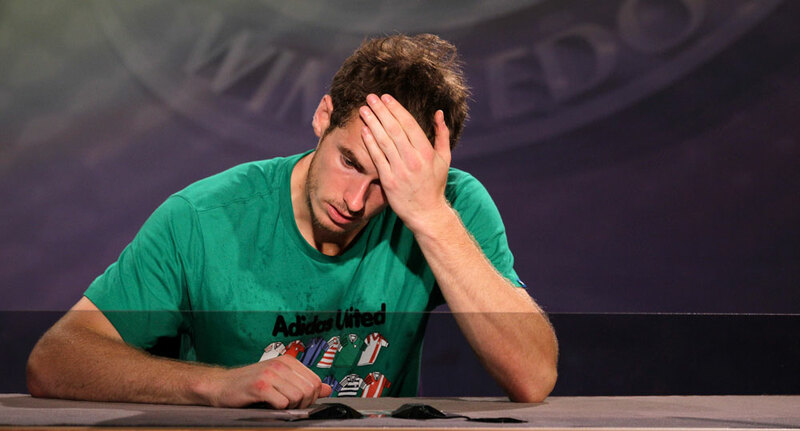 In addition to his on-court problems, Murray has forever endured public scrutiny for his media relations. Of course we would love all the world’s major sports stars to be at ease in front of the media and rattling out streams of memorable press conferences, but that simply isn’t Murray. It is not in his nature. Naturally he is a fairly shy man off the court and as such he doesn’t exactly relish being constantly thrust into the gaze of the media. He has needed to accept that such attention comes as part of the package of status and privilege, but still it is hardly surprising that he often loathes such spotlighted treatment. Murray has become accustomed to such criticism, however, in recent times he has seemed to break these shackles. Whether this is resultant of a conscious decision to boost his public image or not is unclear. One thing is clear though, and that has been this recent transition and increasing popularity. Maybe such a transition can be attributed to an ever-increasing realisation that Murray is well and truly up against it. Perhaps the public are merely beginning to demonstrate a greater understanding of the depth of competition which Murray must face in order to go on and win a Slam. 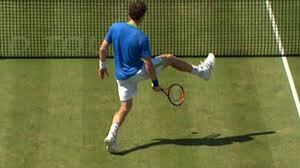 Couple this understanding with Murray’s improving on-court temperament and the predicament begins to make more sense. 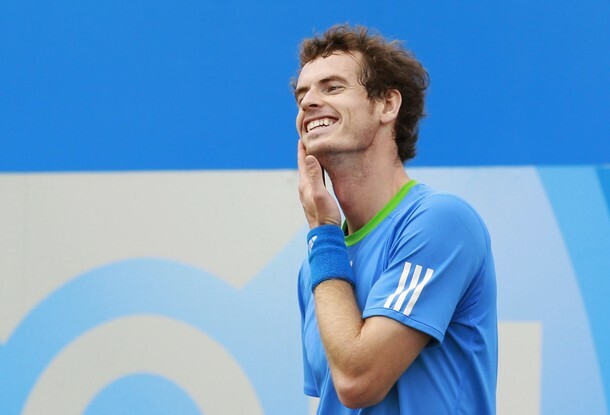 We know for sure that Murray has invested time in improving the psychological side of his game. This has included meetings with fellow British sporting talents such as David Haye, a man Murray admires greatly. Scarcely could you encounter two sports men with more differing approaches to the media spotlight, and the very fact that Murray has sought Haye out could be indicative of his desire to enhance his public image. It could well be that such meetings and advice have contributed to Murray’s recent exhibitions of ‘show-boating’ on the court. This has been evident in his recent grass-court victories over Jo-Wilfred Tsonga and Ivan Ljubicic. These performances have seen Murray unleash what is in danger of becoming a trademark shot where he elegantly performs something of a step-over combined with the cheekiest of dinks through his legs. Such ‘peacock-ing’ in high profile victories is something which requires immense confidence and self-belief coupled with a desire to entertain beyond the call of duty. Perhaps this arrogant edge and willingness to amuse the public is a major sign of Murray’s growth into a greater sporting personality. Murray has dismissed his new trick shot as just something which he does to mess around in training and something which he is scared will make him look a “plonker”. So far in competitive matches though it has a 100% record of success as each of these audacious strokes have been winners.One would think that if he continues to play the role of the exhibitionist that it will provide himself and the media with a point of interest for all that surrounds his game, something which is likely to allow Murray to gain admirers. After a couple of days away form the court Murray will have to return on Monday to take on the wiley Richard Gasquet in what on paper appears to be a very tough and attractive match. We await to see if he will again take on the role of chief entertainer as the anticipation and hopes of the nation begin to reach fever pitch once again. With Rory Mcilroy currently destroying the field at Congressional it seems once again that a maiden Major title is well within his grasp. He is furthering his reputation as a major player and looks to be creating a trademark for himself with an unerring ability to consistently go low in the early rounds of golf’s premiere events. Such confidence and extreme scoring has again created a buzz around the young Northern Irishman comparable only to that which surrounded the young Tiger Woods fifteen years ago. Just as was the case with the young Tiger, Mcilroy is far from the finished article at the age of 22 and still has several areas of his game in need of refinement. This though is the major reason for the impression which Mcilroy is making. His potential is frightening, he is already going in to Majors and shooting unbelievable scores when his game is way short of what it could eventually prove to be. He may not yet be the model of consistency that fellow europeans Lee Westwood, Luke Donald and Martin Kaymer are, but more than these three appears to be making the greatest splash when it comes to major events in 2011. It is scary how at ease young Mcilroy seems amidst the excitement and anticipation which surrounds these events but in the wake of his final round capitulation at Augusta caution must be taken if Mcilroy is to break his major duck this weekend. The hideous scenes in the final round at Augusta this year were painful to watch as Mcilroy relinquished his stranglehold on the title around Amen Corner. These uncomfortable scenes were emphasised by the host broadcaster’s apparent decision to spare the public from having to watch Mcilroy’s demise once he had slipped from a four shot lead going in to a few shots back from the lead. It was the toughest day of Mcilroy’s fledgling career but now holding a six shot lead at the halfway stage of the US Open it will be fascinating to see if he can prove he has learnt from his deadline day demons at the Masters. To secure his first major scalp at the very next attempt following his this disappointment would be some signal of intent, and one which could see Rory cement the changing of the guard amongst golf’s elite. Rory's Masters Misery, will there be a repeat performance? Rory has much to do in order to match the career achievements of the ailing Tiger Woods but there are some definite comparisons to be drawn. When they are in the zone and competing at the business end of events they bristle with verve, confidence and assurance. Mcilroy perhaps lacks the intensity which has forever been part and parcel of Woods’ game, but they both seem to possess a similar auror and authority. Perhaps the greatest compliment which could be paid to Mcilroy is that his game at this age is arguably more technically sound and certainly more maintainable than that of Woods. He is able to produce phenomenal length and greater accuracy all with a swing which places seemingly far less stress upon his body than that which Woods’ swing inflicts upon his own. One would hope that this will stand Rory in good stead in his quest for a career of longevity as he seeks to emulate the successes of his heroes, including those of the great Tiger Woods. 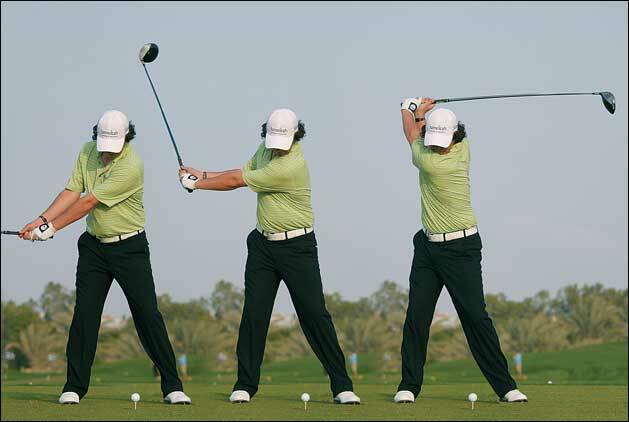 Is this the swing which will give Rory success coupled with longevity? Rory is certainly taking a little longer than Woods did to become a consistent winner on tour, but his unmistakable talent and natural swing and ability have set him out on an exciting career path. It is yet to be seen whether he can go on to match Woods’ achievements but if he does it could prove to be achieved with more of a marathon than a sprint. Even if he doesn’t go on to match Tiger, it seems implausible that he won’t go on to become the number one in the world at some point in the not too distant future. With Woods’ future in the game looking ever more uncertain, there is a huge void at the top of the game for a real character capable of sending the galleries of the world’s tours into raptures. 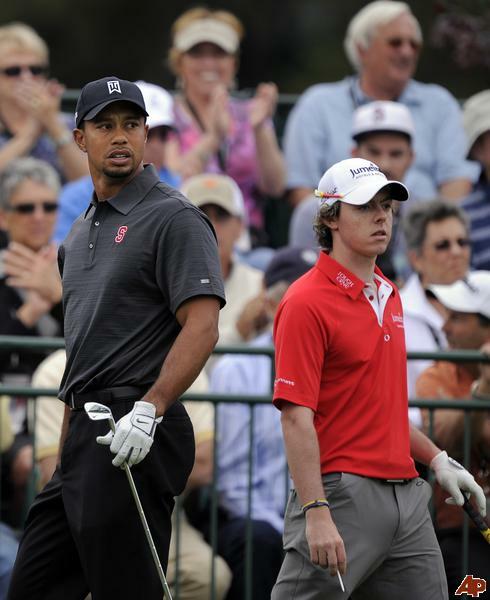 Rory certainly seems to have a similar effect on golf’s greatest audiences and the thought of a developing Mcilroy and a recuperating Woods battling it out at the peaks of their powers is wondrous if not a little romantic given Woods’ ill health, both physical and psychological. This weekend will be a huge test of character for Mcilroy, and we await with baited breath to see if he can hold his nerve this time around. He possesses all the talent in the world, all he needs now to prove that he is a real force is a Major to his name and this Sunday evening could see him claim his first. Can England’s elite take financial strides to try and match Barca’s brilliance? With Barcelona’s demolition of Manchester United last week resonating through the footballing world, Europe’s top clubs will certainly be feeling the need to improve their ranks. It may seem unrealistic that any team can invest and bring in anyone of the level of genius which graced the hallowed turf of Wembley last week, but that shouldn’t stop the British clubs assault on the transfer market this summer. The topsy-turvy nature of events in the Premier League this season means that any one of six teams will be going in to the new season with dreams of winning the title. I will consider the chances of each of the four most prominent contenders and weigh up their potential movement in the forthcoming transfer window. The events over the closing weeks of the season will have seen manager Arsene Wenger sick to the very pit of his stomach. The enthusiasm and verve present amongst his team of young stars for much of the season simply appeared to fizzle out, and with it their chances of silverware were lost without a trace. The moment which encapsulated all the frustration of their campaign was the late winner scored by Birmingham City in the Carling Cup final. Having gone without any silverware for several years, to then go and throw away a lead in a cup final against a side who went on to be relegated from the Premier League is beyond disappointing. It is criminal, absolutely criminal. Not only did this moment of footballing agony demonstrate a lack of nerve but it also highlighted their need for an experienced and imperious central defensive pairing and a top quality goalkeeper. In terms of goalkeepers they have plenty of options, though the experienced ones would probably prove to be the wisest investments. I believe the man they should target is Shay Given. He is a fantastic shot-stopper who has experience at the highest levels of international football and european club football, all the attributes of a fantastic keeper. This is a transfer which could very feasibly happen as Wenger is rumoured to be a long-time admirer of the Irishman and he has been rather frozen out at Manchester City this season. In addition to a keeper it is very important that Wenger breaks his own policy of only investing in youth and invests in a battle-hardened experienced centre back that preferably has premiership experience. A good buy would be Chris Samba of Blackburn Rovers who has been immense this season and has shone above the turmoil at the club and their battles against relegation. He wouldn’t cost the world and would be keen for a big move having had a transfer request rejected by the club in the most recent transfer window. It is these defensive areas which need the most attention at the club this summer, but perhaps other areas could do with strengthening too. One option could be to invest in a new holding midfield player as an alternative to the young Alex Song, who has certainly demonstrated some promise this season but needs time and competition to drive his career in the right direction. The obvious investment here would be Scott Parker who this season has demonstrated outstanding mental strength, desire and tremendous ability whilst captaining a sinking ship. With West Ham relegated to the Championship Parker will be looking to ply his trade elsewhere and I believe Arsenal would be an ideal fit for a player of his talents. One final suggestion for Arsenal could be to invest in a striker. Their over reliance upon the injury prone Robin van Persie has become a serious concern, and whenever he is unavailable they struggle to come up with the goals necessary to win a Premier League title. This may seem a controversial suggestion but former Spurs and current Manchester United striker Dimitar Berbatov could well prove a fantastic signing for the ‘Gunners’. He is creative, skilful and elegant which would be in-keeping with Arsenal’s philosophy and he is a proven goal scorer at the highest level. Such talent coupled with the fact that his omission from Manchester United’s Champions League final squad seems to have signalled his departure, could well prove this to be a viable option. Manchester United have had a fantastic season, but their lack of quality ball players and central players with the drive to track the opposition were exposed by Barcelona’s majestic performance against them last week. With the departure of old-hands Edwin Van Der Sar and Paul Scholes this summer there appears to be the need for investment in goal and in the middle of their midfield. It seems as though David De Gea of Athletico Madrid has won the battle for the coveted keeping vacancy at Old Trafford, and I would say he is a wise investment. He may only be very young, but he has already had a taste of Champions League football and has emerged as one of Europe’s finest young keepers. So that leaves the need to invest in a midfield play maker to replace Scholes. A few names have been touted for this role such as Luka Modric of Tottenham and Inter’s Wesley Sneijder. Both of these players would be exceptional signings and an ideal replacement for one of United’s most loyal and talented servants of all time. Another possibility that is rife with rumour amongst the media is for United to sign Samir Nasri in a cut-price deal due to his contractual wrangling at Arsenal. Sir Alex Ferguson is a canny operator and it wouldn’t be beyond the realms of possibility that he could make this deal happen, and if he did it would be a remarkable coup given Nasri’s form over the last year. Another potential problem for Manchester United to deal with this summer is that it seems certain that Dimitar berbatov will leave the club. He won the golden boot this season and losing him would effectively leave a void of twenty to twenty five goals a season. Sir Alex Ferguson may well entrust some of his young charges like Javier Hernandez, Danny Wellbeck and Federico Macheda with this responsibility but their does appear to be justification for movements in this direction during the window. What a season Chelsea have just had. It has been tumultuous to say the least and the recent sacking of Carlo Ancellotti will have done nothing to steady the ship. However, there is a very definite need for them to improve the depth of their squad and a new manager at the helm usually means that their will be money made available for transfers. Areas of concern for Chelsea could be the wide areas of their midfield and in attack. It seems likely with the amount of money invested in him that Chelsea will remain faithful to Fernando Torres in spite of his lacklustre form since signing for the club. Such faith coupled with the apparent inability of Didier Drogba and him to blend as a partnership could see Drogba their talismanic striker leave this summer. If he does go then Chelsea will need to invest in this area as they can’t afford to part with a player of Drogba’s stature without having lined up a replacement. Karim Benzema would fill the role very nicely and Real Madrid would perhaps be willing to part with him, alternatively they could try and lure Sergio Aguero from Athletico Madrid as they are failing to make the strides necessary to keep hold of a player of his talents. Young Brazilian talent Neymar has also been heavily linked with a big money move to the club. In midfield their appears the need for greater creativity and innovation in order to supply the likes of Torres with greater effect and regularity. An option here would be to try and lure Kaka from Real Madrid. However, since Ancellotti has been sacked by the club this has become an even more remote option given the link between the two men, an alternative could perhaps be Luka Modric. Potential Ins: Kaka, Modric, Aguero, Benzema, Neymar. Potential Outs: Ferreira, Bosingwa, Drogba, Sturridge. Now that City have seemed to join the elite of English football by securing the FA Cup and Champions League qualification, could it then be time for them to make a real assault on European football. If this is to be the case then they need to strengthen again. In defence this season Vincent Kompany has been a revelation but given Kolo Toure’s absence from the game for a failed drugs test and Joleon Lescott’s lack of experience at the summit of European football this could be an area that needs strengthening. A possible option could be Bolton Wanderers’ Gary Cahill, a very talented young man who would certainly provide a good alternative to Lescott in the heart of their defence. Another chink in City’s armour could be in defensive midfield where current first teamer Gareth Barry’s form has appeared to slump over the past twelve months. One option for his replacement could be Scott Parker who seems to have grappled this position away from Barry at international level for England. He is likely to be subject to much interest this summer given his impressive form but City’s millions and the prospect of Champions League football may be enough to tempt him to sign up. On final area of concern for City is in attack where they must do all in their power to keep a hold of their star player Carlos Tevez. He is one of their only ‘X-Factor’ players and in truth is pretty irreplaceable. However, if he does decide to leave then City will have to come up with an exceptional replacement. Possible options could be Benzema, Berbatov and Aguero but in truth these players could pale in comparison to Tevez and his consistently fantastic contribution to the club. Potential Ins: Anyone! (Benzema, Berbatov, Aguero, Kaka, Cahill, Parker) Potential Outs: Anyone! (Tevez, Barry). Whatever unfolds between now and September it appears that we are set for a turbulent summer of big money and major transfer activity, which could perhaps exceed anything like what we have seen in the past. If this is is the case then it will prove to be a hugely exciting period and one which could potentially shape the balance of power in English and European football for years to come.